Wikipedia is the popular online encyclopedia that announced a partnership with Aircel telcom to offer free access to view the contents of Wikipedia. 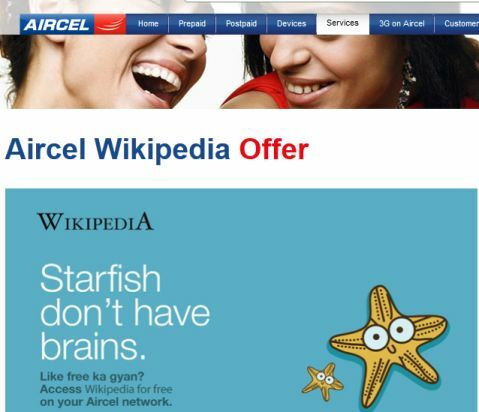 This offer lets you browse the Wikipedia pages from your mobile phone without any internet charges for Aircel customers. This partnership is part of the Wikimedia Foundation’s “Wikipedia Zero” programme that focusing to deliver free knowledge and enable mobile access for Wikipedia without any charges in developing countries. With this offer, 60 million new users will join this programme in this region and the total of 470 million users access the Wikipedia across the world. Aircel customers can access the versions of Wikipedia in English, Hindi, Tamil and 17 other indic languages. The offer valid for all Aircel prepaid mobile users except Blackberry and Postpaid customers. You can access Wikipedia by enter the address “m.wikipedia.org” from your internet enabled mobile browser. 1.Use Wikipedia on your default mobile browser. Don’t browse with third party browsers like Opera and UC browser. Otherwise you will be charged. 2.The offer is free of cost but you must have sufficient balance. any think for activation for this ..